CHICAGO — The Chicago Blackhawks honored Hall of Famers Bobby Hull and Stan Mikita before their game Friday night against San Jose. Earlier this season, the team announced that the two long-estranged stars would "rejoin the Blackhawks family" as ambassadors. The move followed the death of owner William W. Wirtz in September and the installation of son Rocky as team chairman. Hull is the Blackhawks' career goals leader with 604. Mikita holds team records for points (1,467), assists (926) and games (1,394). Both starred in the 1960s and into the 1970s, and played for Chicago's last Stanley Cup-winning team in 1961. 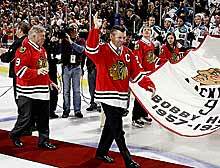 Rocky Wirtz was cheered by a sellout crowd when he introduced Hull and Mikita from center ice. When Hull left for Winnipeg of the World Hockey Association in 1972, his departure was seen by William Wirtz as a defection. Still, the team retired Hull's No. 9 in 1983. "In 1972, I left this wonderful city thinking I would never again be part of the Blackhawk family," Hull said. "It just shows you if you hang around long enough, you not only get one kick at the can, you get a second one." In 1980, Mikita's No. 21, was the first ever retired by the Blackhawks. "I was proud to wear the Indian head uniform for 22 years," Mikita said. "Tonight I am even more proud to be part of the great moments that lie ahead for this great franchise."